17 posts categorized "Synthetic Diamonds"
If you live in or are visiting New York City the next few months, you might want to stop by the American Museum of Natural History and get a rare chance to view some exceptional colored diamonds. September 15 was the opening of a new display of in the museum’s Morgan Memorial Hall of Gems. An intense-pink brilliant diamond from the Argyle Diamond Mine in Australia set in gold metal mounting with small pink diamonds designed by Carvin French. A 5.4-carat round brilliant-cut diamond set in a white gold pendant with 20 sapphires, designed in California in 1960. Five vivid naturally colored diamonds ranging in size from 1.01 to 2.34 carats from the Olympia Diamond Collection, which are on loan from Scarselli Diamonds. The five diamonds are a 1.01-carat vivid orange-yellow diamond (mined in Africa), a 1.02-carat vivid blue-green diamond (mined in Brazil), a 2.17-carat vivid purplish-pink diamond (Argyle Mine in Australia), 2.13-carat vivid blue diamond (mined in Africa), and a 2.34-carat vivid orange diamond (from Africa). The vivid color grade is the highest colored diamond grade given by the GIA (Gemological Institute of America) and these five diamonds are rare because they are completely saturated colors. Synthetic (laboratory-grown) diamonds from the Boston-based Apollo Diamond Corporation, created using the chemical vapor deposition (CVD) technique. The display shows the stages of growth of CVD diamonds as the diamonds form in gas mixture to a heated chamber containing “seed” material. Synthetic (laboratory-grown) diamonds from Sarasota, Florida-based Gemesis Corporation, created using the high-pressure, high-temperature (HPHT) technique, which uses large presses to transform carbon material to diamond using compression. The display includes uncut and cut (polished) diamonds, loose and in jewelry. This special colored diamond display runs until January 2010 and is free with admission to the museum, which is located at Central Park West and 79th Street in Manhattan. Synthetic diamonds catch the public’s attention because they immediately think of the man-made diamonds replacing diamonds in the jewelry industry. However, the motivation behind researchers usually has more to do with industrial applications. 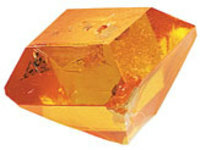 Diamond’s hardness, high thermal conductivity, high electrical resistivity, optical transparency, resistance to chemicals, and other unique properties make it a valuable material for a variety of uses including surgical scalpel blades, equipment “windows” exposed to harsh environments, heat-spreaders for electronic devices, temperature and pressure sensors, and drill bits used in mining and oil exploration. Scientists at the Carnegie Institution‘s Geophysical Laboratory recently announced an enhanced process for growing diamond crystals using the chemical vapor disposition (CVD). Most synthetic diamond methods require high temperature and extremely high pressure to mimic nature’s own diamond growing process. However, the CVD process uses high temperature but low pressure to produce single-crystal diamonds rapidly and with more controlled results. The Carnegie researchers add a new twist to the synthetic diamond process by heating the diamonds at temperatures up to 2000 degrees Celsius but low (less than atmospheric) pressure to alter the color of the diamond. The raw synthetic diamond crystals are usually yellow-brown in color but this special annealing process transforms the color to a colorless or light pink hue. With the ability to use low pressure, researchers have been able to identify the specific crystal defects that cause color changes in diamonds. This annealing process uses microwave plasma to produce the high heat at low pressure, yet keeping the diamond from changing to graphite. Producing colorless diamonds has been a challenge for synthetic diamond manufacturers and getting a faint pink color could end up being a bonus. This ability to produce colorless diamond crystals has value not only in the jewelry industry but also in many of the industrial applications where colorless transparency has increased value. Consumers shopping for diamonds are often confused by some of the terms used to differentiate natural diamonds from diamond produced by man. Part of the problem stems from marketing strategies that intentionally cloud the issue in an effort to position their project as being different and somehow better than other synthetic diamonds. At a World Diamond Congress meeting in Shanghai recently, the three major international diamond and jewelry trade organizations agreed on standardized terminology that is acceptable to describe synthetic diamonds. Those organizations included the World Federation of Diamond Bourses (WFDB), the International Diamond Manufacturers Association (IDMA), and the International Diamond Council (IDC). According to the new rules, laboratory created gem-quality diamonds can be described by the words: “synthetic”, “laboratory-grown”, “laboratory-created”, or “man-made”. The word “diamond” or “diamonds” must always follow these descriptors. The term “cultured” is not acceptable to describe gem-quality synthetic diamonds. With the quality and quantity of synthetic diamonds increasing, the diamond industry is adjusting its diamond grading and marketing processes to allow consumers to make informed decisions about whether to purchase natural or synthetic diamonds. 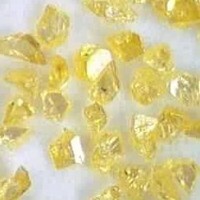 Gemesis, the Florida-based synthetic diamond company, currently only produces the laboratory grown diamonds in yellow and orange colors. The company is working on production techniques to produced pink and blue synthetic diamonds. It hopes to have that process developed by the end of this year. Gemesis is also working on process that would eventually allow it to grow white diamond crystals in the 5 to 10 carat range that are in greater demand worldwide. These larger sized synthetic diamonds are probably at least three years away from commercial production. Gemesis has recently updated their web site to provide educational information about their company and synthetic diamonds, including the jewelry brands carrying Gemesis Cultured Diamonds. Check out my previous post entitled "Synthetic Diamonds or Diamond Simulants: Why the Confusion?" In June, the Gemological Institute of America (GIA) informed the World Diamond Congress in Tel Aviv, Israel that the GIA Laboratory intended to grade synthetic diamonds. There was overwhelming agreement by the diamond industry that synthetic diamonds should be graded so that consumers would receive proper disclosure when the lab-grown diamonds enter the marketplace. However, there has been months of heated debate over what language should be used to described synthetic diamonds. The producers of synthetic diamonds feared consumers would perceive the word “synthetic” to be the same as fake or simulated diamonds. The providers of natural diamonds wanted language that would clearly differentiate lab-grown diamonds from diamonds mined from the earth. The GIA’s new Synthetic Colored Diamond Grading Report clearly identifies the diamond as laboratory-grown and refers to the man-made origin four times. The new report also uses grading terminology to describe color and clarity that is different than is used for natural diamonds on their traditional reports. 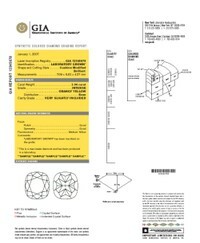 The GIA instead will laser inscribe "laboratory grown" on diamonds produced in a lab that do not already have an inscription with Federal Trade Commission-approved language such as "man-made," "lab grown" and branded names such as "Chatham created.” The producers of synthetic diamonds have stated that all their diamonds will be laser inscribed with some type of synthetic nomenclature but the GIA will ensure that all synthetic diamonds will be laser inscribed with proper disclosure. The GIA Laboratory will begin accepting lab-grown diamonds for grading using the new reports on January 1, 2007. After decades of researching synthetic diamonds, The International Gemological Institute (IGI) has implemented their new Laboratory-Grown Diamond Grading System. The IGI has been developing and testing the system for more than a year. The purpose of using the term laboratory-grown and the information on synthetic diamonds on the new reports is the IGI’s attempt to better educate consumers and provide accurate and reliable product information on the lab-grown diamonds entering the marketplace. The terms “synthetic” and “cultured” have been so widely used in the marketing of man-made diamonds that the many consumers do understand the difference between these laboratory-grown diamonds and natural diamonds. In an effort to be clear about the proper disclosure and communication of the synthetic origin of these diamonds, the EGL USA group has revised their diamond grading reports. The EGL now uses the term “laboratory-grown” to disclose the synthetic origin of the diamond. EGL USA gemological reports for synthetic diamonds have a new gray color theme to distinguish them from the dark blue scheme for natural diamonds. Synthetic diamonds have a mandatory laser inscription that includes the term “lab-grown” (or its equivalent), the manufacturer (if known) and the EGL USA report number. The back cover of the new synthetic report features information about the different synthetic manufacturing processes, detection techniques, and grading methods. The report identifies the type of synthetic origin: High Pressure High Temperature (HPHT) or Chemical Vapor Deposition (CVD). The report contains an identification section that indicates long-wave and short-wave fluorescence, microscopic features, and diamond type. From the time that HPHT treated diamonds entered the gemstone marketplace in 1999, the EGL USA has continued research efforts to develop reliable detection and identification procedures for HPHT diamonds. Synthetic diamonds are a reality and a challenge to the natural diamond industry, a De Beers official noted at the International Diamond Conference held in Windhoek on Wednesday. Varda Shine, who is the Sales Director at the Diamond Trading Centre (DTC), said her company had formulated ways to counter the challenge posed to their operations by the manmade gems. She said De Beers - the world's largest diamond trader - was currently using the systems of differentiation, detection and disclosure for the consumers to know what type of diamond they were purchasing and to ward off confusion. Shine said that natural diamonds were special to many customers because they encompassed an aura of mystery and history, among other features. She added that with technology developing, the synthetics industry was bound to grow and would pose a bigger challenge to natural diamonds as time goes on. Gem-quality synthetic diamonds have entered the jewellery market in recent years and the technology used to create them is improving rapidly. Traders, dealers and customers are not able to distinguish the difference between natural diamonds and the ones created in a laboratory with the naked eye. Israeli diamond merchant Lev Leviev, who is also the Chairman of LLD Diamonds, told the gathering that at the end of the last century, the African diamond-producing nations had slipped from their pole position of being leading suppliers due to new developments. Leviev said new sources, including synthetic diamonds, were becoming a target for investors. According to a mining engineering website, (www.min-eng.com) synthetic diamonds have been manufactured in production plants for many years now and production reportedly now runs at more than 100 tonnes per year. Lab Says it Makes D Flawless Diamonds, But Does it? A company from Franklin, Wisconsin, Diamond Nexus Labs, claims to make colorless and flawless "lab-created diamonds", offered for $79 a carat. This is an attractive proposition. However a closer examination reveals that they are misrepresenting themselves in their address to the public. The DTC, in its recent Consumer Confidence campaign, is promoting the three D's. One of the D's, Disclosure, is not all together clear when it gets to the offer made by Diamond Nexus Labs. It claims in its latest marketing effort that "Laboratory breakthrough creates ideal man made diamonds". In the opening paragraph of its press release from this morning (Monday) Diamond Nexus Labs says "Gemologists agree that Diamond Nexus Labs lab-created diamonds are glittering and brilliant because they come closer than any other gem material to matching, often besting the characteristics of mined diamonds." "For serious consideration, Diamond Nexus Labs manufactured diamonds must be compared by using the same properties evaluations as the mined diamond industry," and goes on to discuss the Four C's, claiming "Diamond Nexus Labs cultured diamonds are always pristine clear transparent "Ds". However the proposed lab made diamonds are not that at all and that is not clear until visiting the company's website where it states that they make diamond simulants. But while this statement appears below the company name, even when reading 'The Science Behind The Breakthrough' page on the site, it is not completely clear that the company is not making diamonds of the kind that Gemesis does. Will it be understood by an average consumer that this is not a lab made diamond but rather a simulate? "The importance of full disclosure is paramount," says De Beers' spokeswoman Lynette Hori. "Diamonds are a significant emotional and financial investment and when consumers are buying them they need to be able to trust the entire buying process and not feel misled in any way. "…People will only continue to buy diamond jewelry if they have confidence in the product," she adds. "Therefore, giving the consumer complete and correct information about the product is crucial to maintaining consumer confidence," she emphasizes. "Full disclosure entails a commitment to proactive and full declaration of all treatments, Synthetics and Simulants. It is essential to make sure that people do not buy a Synthetic, Simulant or Treated Diamond believing it to be a diamond." Robert Joseph from Diamond Nexus Labs said in response: "The banner on the home page of our web site says “diamond-simulant gemstones” at the top in big letters. Anyone writing an article (who surely would visit our site if they were the least bit diligent) or visiting our site cannot possible miss that. "We have no confusion from our customers who know what that they are buying upfront, and have a money-back guarantee if they are not satisfied with their purchases. We make no effort or pretense into making people think we are selling mined diamonds. Our merchandise is an alternative to those on a tighter budget or who don’t want to spend the money for mined diamonds."